The Embassy label occupied a unique niche in the UK record business during the late 1950 and early ‘60s as the label on which budget-priced cover versions of current chart hits were released for exclusive sale in Woolworth’s stores, and it was massively successful, to the extent that the label retains an army of fans half a century later. Using orchestras, choruses and soloists drawn from the ranks of the best session performers of their day, the label also recorded a succession of EPs and then LPs covering many forms of popular music, notably that of music from stage and screen, and this collection is devoted to that output. 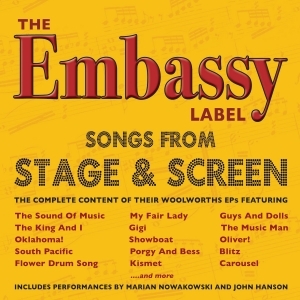 It encompasses the tracks from all of the EPs which Embassy released which featured highlights from contemporary musicals from illustrious composers: ‘The Sound Of Music’, ‘Oklahoma!’, ‘Carousel’, ‘South Pacific’ and ‘Flower Drum Song’ by Richard Rodgers & Oscar Hammerstein; ‘My Fair Lady’ and ‘Gigi’ by Alan Jay Lerner & Frederick Loewe; ‘Showboat’ by Jerome Kern & Oscar Hammerstein; ‘Porgy & Bess’ by George & Ira Gershwin; ‘Guys And Dolls’ by Frank Loesser; ‘Kismet’ by George Forrest & Robert Wright; ‘The Music Man’ by Meredith Willson and ‘Oliver!’ and ‘Blitz’ by Lionel Bart and more. It’s a great value 90-track 3CD set with top class renditions of some of the most popular and best-loved music of the era.